We stock a 3 peice Lumber Tarps with Flaps with 8’ drops in 18 OZ Black Vinyl. Ends are 24’6” W X 18’ L and the Center piece is 24’6” W X 20’ L with grommets on the hem and 3 Rows of 3 rows of D-rings. Custom construction, sizes and colors available. 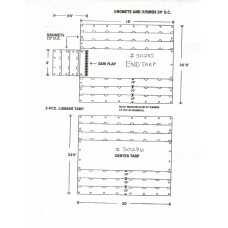 24'6"W X 18'L (End Tarp) 3 Piece Lumber Tarp with Flap End, 14 OZ Top / 10 OZ Sides Combination, Bla..
24'6"W X 20'L (Center Tarp) 3 Piece Lumber Tarp 14 OZ Top / 10 OZ Sides Combination, Black - 8' Drop..